The flag-draped casket of former President George H.W. Bush is carried by a military honor guard during a State Funeral at the National Cathedral, Dec. 5, 2018, in Washington. Bridging decades and the vast contemporary political divide, five U.S. presidents assembled Wednesday to mourn one of their own — George Herbert Walker Bush, who died last Friday at the age of 94. "He taught us public service was noble and necessary," his son and the 43rd president, George W. Bush, told the invited guests at Washington National Cathedral. "He had an enormous capacity to give of himself." President Donald Trump had no speaking role during the Episcopalian service, a break from recent tradition and in accordance with Bush's wishes. Trump had tweeted before the service: "Looking forward to being with the Bush family. This is not a funeral, this is a day of celebration for a great man who has led a long and distinguished life. He will be missed!" The current president, who has had a contentious public feud with the Bush family, earlier had declared Wednesday a national day of mourning, closing federal agencies, suspending regular mail delivery and closing stock markets. Trump, the day before, had spent 20 minutes visiting Bush family members staying across the street from the White House at Blair House. Trump, accompanied by first lady Melania Trump, shook hands inside the cathedral with his immediate two-term predecessor, Barack Obama, but the tension between the Trumps and Obama was palpable in the pews, epitomizing the nation's political divide. Also, in the front row was Democrat Bill Clinton, who defeated the elder incumbent Bush in 1992 to become president, and his wife, former Secretary of State Hillary Clinton, whom Trump defeated in the 2016 election. Bush and Clinton eventually became close friends and traveled together internationally. Another close friend of Bush's, former U.S. Senator Alan Simpson, recalled that the 41st president was "a class act from birth to death...one of nature's noble men." Bush was hailed by presidential historian Jon Meacham as "America's last great soldier-statesman" who "made our lives and the lives of nations freer, better, nobler and warmer." Among the foreign dignitaries inside the cathedral were Britain's Prince Charles, Jordan's King Abdullah II and Queen Rania, German Chancellor Angela Merkel, Polish President Andrzej Duda and formers presidents of Estonia, Mexico and Portugal, as well as former prime ministers of Britain, Canada, Japan and Kuwait. Former President George W. Bush and former first lady Laura Bush stand at the flag-draped casket of former President George H.W. Bush as he lies in state in the Capitol's Rotunda in Washington, Dec. 4, 2018. 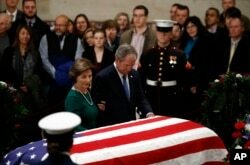 ​Bells tolled 41 times as Bush's casket entered the cathedral after being transported in a family motorcade from the U.S. Capitol and past the White House for the first state funeral for a president in a dozen years. Around the clock in the Rotunda over two days, thousands many who had lined up in near freezing temperatures for hours to enter the Capitol paid their final respects to Bush, whose flag-draped coffin rested on the wooden catafalque built in 1865 for the casket of assassinated President Abraham Lincoln. The four entrances to the Rotunda were draped in black as Bush's body lay in state, an honor bestowed to only 31 others in the history of the United States (Lincoln being the first president). Former Sen. Bob Dole salutes the flag-draped casket containing the remains of former President George H.W. 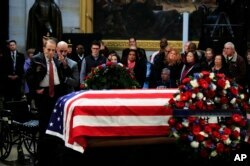 Bush as he lies in state at the U.S. Capitol in Washington, Dec. 4, 2018. One of those who entered the Rotunda on Tuesday was former Senator Bob Dole, a rival to Bush in the 1988 Republican presidential primary. Dole, who is 95, was helped from his wheelchair to stand and salute his fellow World War Two veteran. Bush was born into privilege and politics (his father a U.S. senator and grandfather a top industrialist). He served in Congress, ambassador to the United Nations, chaired the Republican National Committee, envoy to China, director of the Central Intelligence Agency and vice president before being elected president in 1988. After Wednesday's funeral, the casket was taken to Joint Base Andrews in nearby Maryland to be flown back to Bush's home state of Texas on the same specially configured Boeing 747 he frequently boarded as Air Force One. A service will be held Thursday at St. Martin's Episcopal Church in Houston before the late president embarks on a final 120-kilometer (75 miles) ride on Locomotive 4141, with the blue-and-white paint scheme of Air Force One, to College Station for burial at his presidential library on the grounds of Texas A&M University. He will be buried alongside his wife, Barbara, who died earlier this year, and their daughter, Robin, who succumbed to leukemia in childhood. Ken Bredemeier contributed to this report.